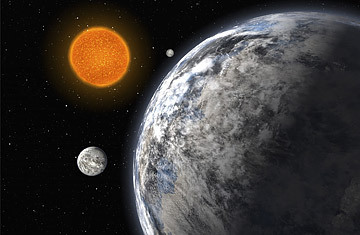 An artist's impression of "super-Earths" orbiting a nearby star discovered by European researchers. Think it's hard counting the census here on Earth? Try it when you're keeping track of the population of the sky. There are more than 70 sextillion  or 70 thousand million million million  stars in the cosmos, and that doesn't include uncountable moons and asteroids and comets and more. With all that, you wouldn't think you could generate much buzz by announcing that astronomers had spotted a few dozen more bodies whirling about out there. But a buzz is just what was created yesterday at a meeting in Nantes, France, when Swiss astronomer Michel Mayor of the Geneva Observatory reported that he and his team had discovered 45 previously unknown planets orbiting a handful of nearby stars. There's good reason for all the excitement. There was never much doubt that planets other than the known nine (or the known eight, now that Pluto has been demoted) existed, but it wasn't until 1995 that the first of these so-called exoplanets was discovered. The vast distance between stars makes a comparatively small body like a planet invisible to even the sharpest-eyed telescopes. Instead, astronomers had to rely on a less-direct method, looking for tiny wobbles in the star itself. A star that couldn't stand still was almost certainly being tugged on by something, and that something was likely to be the gravity of an orbiting planet. Mayor himself was the one who spotted that first exotic world, and in the years since, he and other investigators have counted about 270 more. But land in the cosmic exurbs is decidedly inhospitable. Almost all of the newly discovered planets were huge, hot and gassy, Jupiter-like bodies lying scaldingly close to their suns. There might have been smaller, pleasanter Earth-like planets out there, but the equipment just didn't exist to spot the tinier telltale wobbles they would cause. Now it does  and it's delivered the goods. Thanks to the evocatively named High-Accuracy Radial-Velocity Planet Searcher (HARPS), a telescope mounted atop La Scilla Mountain in Chile, Mayor and his team were able to detect a litter of new planets, some as small as four times the mass of Earth  tiny by exoplanet standards. One star, just 42 light-years away, is home to a trio of such worlds  which Mayor is now calling "super-Earths." The largest of the three is just 9.5 times as big as Earth, the smallest just 4.2 times. It was not only the modest size of all the new worlds that got astronomers so excited; it was the sheer number of them too. Mayor found his planets by studying a group of just 200 stars  an infinitesimal sliver of the total number out there. That has led him to estimate that at least a third of all sun-like stars may be home to Earth-like worlds. "Clearly these planets are only the tip of the iceberg," he told the conference. "Does every single star harbor planets? We may not know the answer, but we are making progress." Even Mayor's newest, smallest planets are unlikely to be pastoral places. All of them lie so close to their suns that they complete one orbit in 50 days or less  compared to the lazy, 365-day journey Earth makes  meaning that any water or incipient life on their surfaces would simply sizzle away. But HARPS is already sensitive enough to spot planets that are 100,000 times smaller than their parent star. Refinements both in HARPS itself and in the next generation of planet-hunting telescopes should make them able to spot smaller and smaller stellar wobbles. Those little wiggles would be the signature of Earth-like worlds lying at a not-too-hot, not-too-cold distance from their suns. And it's on those planets that you just might find Earth-like life.